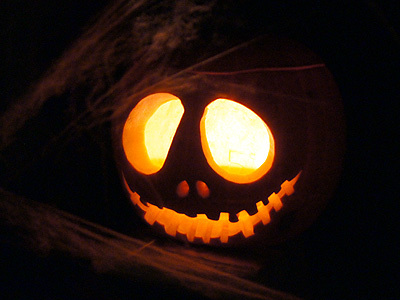 Now that Halloween creativity has passed it's time to knuckle down! I really have been slack with my blogging of late, yes I know bad girl! I have been so busy fulfilling orders, creating new designs and having fun with Halloween decorations and invitations that I have neglected my blog. The funny thing is, I have so many things going on that I have oodles I can say, just not had the time (and drive) to add it. We (hubby and I) have been making all sorts from severed fingers made from Fimo, Halloween costumes, cut throat blade props, specimen jars filled with nasty’s and so much more! Not forgetting our Halloween party menu, which was a lot of fun! 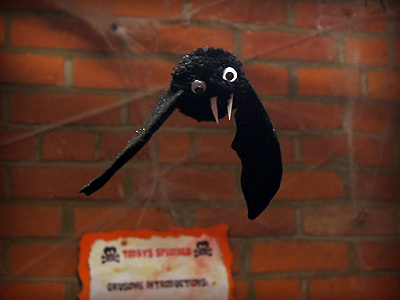 I do hope to write a few posts in the near future showing how we made many of our Halloween decorations, though i have not uploaded photos of some just yet! This photo is of one of my table centre pieces i created, its a storm lantern surrounded by tissue paper black and red roses with little bats flying out suspended on wire. Around the lantern i have created a series of grave stones with alternating scary faces and RIP to cast scary shadows onto the table from the candle light. 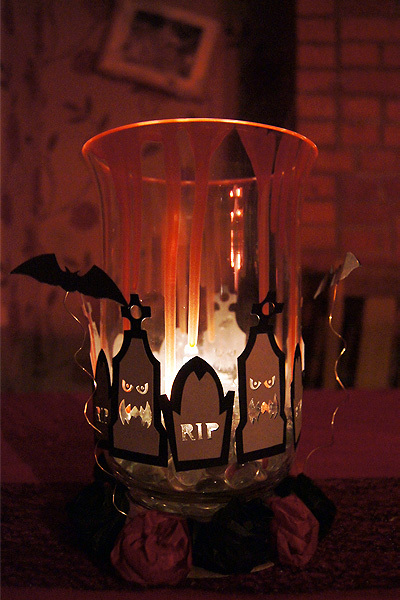 Around the top of the lantern is plenty of dripping blood to create the ambient red lighting! I had so much fun making this one and they really make fantastic wonderfully creepy centre pieces! For our dinner we created a suitably themed dinner menu and actually tried to do a 'Heston' looking (and hopefully tasty) meal. We started with Witches Brew and Moldy old bread, a scrummy Pea and Ham soup! Followed with our "killer Cuisine" of Baked Einstein, baked mashed potatoe piped into the shape of a pygmy brain, shredded flesh a sweet red cabbage and Mrs Lovetts special pie, a pork and apple for our Sweeney Todd special! We finished off with a "Desert to die for" a graveyard (pumpkin) pie, served with rancid cream! 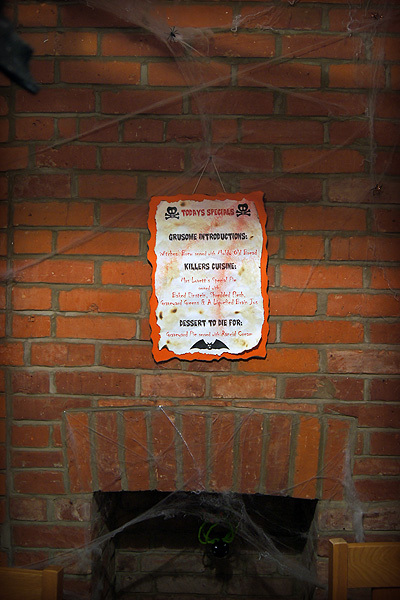 When the guests arrived, the menu was up on our wall, as we kept everything regarding our theme secret! For the evening, we carved up three pumpkins, one for the living room, one for the kitchen and last was our garden convict with an axe in a stump after chopping off his head, with an expression to match! This entry was posted in General and tagged seasonal, distractions, halloween, spooky fun on November 4, 2012 by Sherrie.